View More In Novelty Games. Why Choose GreaSmart Dinosaur Venting Ball? 1.Kids loved toy：Those Stress Relief toys are most popular style slow rising toy for kids. If your kid is having trouble focusing in class, then our Stress Relief Ball is the best choice. 2.As you best partner: Accompany you anytime anywhere If you happen to unhappy, bored, upset, nervous or utterly anxious from time to time. 3.Advantage feature: They are super slow rising, touch soft, After squeeze it, you can see it will rise slowly and return to its original shape. 4. Best gift for holiday deal: They always used to decorate kid's room, backpack, good choice for giving gift for the coming Christmas, kids Birthday, student prize. Functions: Stress Relief Squeeze Venting, helps the blood circulation in the hands. 1. Products are not ediable. Be sure to keep the toys far away from the AGE under 4 baby/toddlers and don't put in their mouth. 2. Do not use sharp things to thorn grape ball. 3. If the ball is dirty, please wash clean with water. If you are not 100% happy with your purchase, 100% Money Back. 1 month for the gratuitous return guarantee. 2018 UPGRADE SENSORY TOYS: The 2018 Novelty Stress Relief Toys come in 4 different colors and 3 kinds(Triceratops,Stegosaurus,Tyrannosaurus Rex). They are extremely soft and easy to squeeze, squeeze its body, colorful beads pop out from the mesh - they will immediately return to their original shape. This colorful stress reliever can be used at home, travel, school or office, etc. Suitable for children and adults of all ages, very comfortable hand feeling.  THE ULTIMATE AND PROVEN STRESS RELIEF: Mesh squeeze balls have been around for quite a while. There is a reason for that. Vent stress, anger, anxiety and any kind of emotion but squeezing this novelty pressure ball. It's great for emotional and physical therapy. It fits perfectly in the hands. It's also recommended for kids and teens with autism, ADD and ADHD.  EXCLUSIVE SEWN MESH BALL WITH DINOSAUR SHELL: This is an alternative and superior version of the popular mesh squeeze ball. 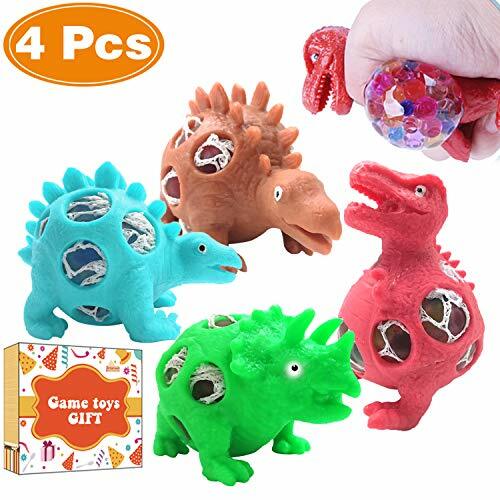 There are soft dinosaur shell outside, Inside each toy stress ball are small, colorful balls that are smooth, durable, and let kids and adults alike enjoy squeezing.  SAFE & DECORATION: These non-sticky stress balls are made of 100% high-quality thermoplastic rubber, these squeezing stress relief balls are hypoallergenic, nontoxic, and free of BPAs, phthalates and latex, making them safe for children; It is not edible. You can decorate your plant with the beads inside the ball once the ball is crushed.  100% SATISFACTION GUARANTEE: If you don't satisfied with our Stress Relief Ball, please fell free to contact us, we will do our best to make it right. Please NOTE: It is one-time consumable spoof vent toy, a few days playing or long time frequent squeeze will crush. Please don't order if this is a problem for you!!! If you have any questions about this product by GreaSmart, contact us by completing and submitting the form below. If you are looking for a specif part number, please include it with your message.